We make no secret of our love for charity work, and even less of a secret about our love for the Christmas period – just check out our Christmas themed window display. So, if we can do something that combines these two things you can sign us up straight away! 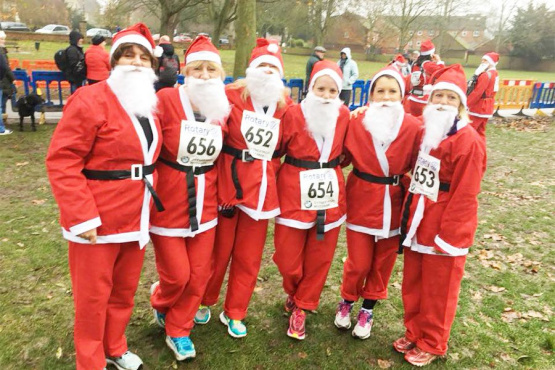 As has become tradition here at the office we entered a team of runners to join the other 2,500+ runners in the Santa’s Fun Run in Marlow organised by the Rotary Clubs of Marlow – we’re old hands now and it’s actually the fourth year in a row that we have participated. The 5km run around Marlow is open to people of all ages so there was a great mix of participants – the old, the young and even the four-legged all dressed as Santa. All this contributed to a great atmosphere full of festive cheer and merriment! Marlow icon and Olympian, Sir Steve Redgrave, set the event off in Higginson Park in the early morning and our team set off on their 5km run raising money for a number of charitable causes in the local area. The two lead charities this year’s event were Scannapeal and The Compassionate Friends. Scannappeal raises funds to provide advanced medical equipment for local patients. They have raised more than £12 million to date and 1 in 4 of the local population has benefited from the work Scannappeal do. You can find out more on their website. The Compassionate Friends is a charitable organisation dedicated to the support and care of bereaved family members who have suffered the death of a child of any age. You can find out more about The Compassionate Friends on their website. We all thoroughly enjoyed the run and can’t wait for next year to do it all again and support more wonderful causes. A big thanks goes out to the Rotary Clubs of Marlow for organising such a wonderful event.